Baking soda, the same stuff that deodorizes the fridge and is the key to scent-control system before a hunt. The stuff can rub your skin raw if you use it straight, so mix a few tablespoons with some liquid no-scent soap. Sometimes showering with straight unscented soap, can still leave an odor. Make a soda-and-clothes lasagna style. Use baking soda like any other powdered detergent to wash your clothes. Dry them, lay a few items in a plastic tote, sprinkle a layer of soda on that, put in another layer of clothing, sprinkle more soda, and so on until the tote is full. 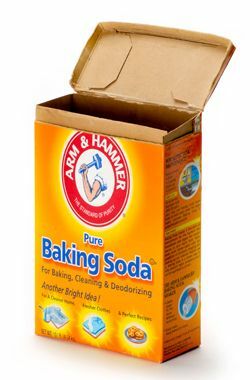 Then place an open box of baking soda in with the clothes and seal the tote up. Obviously, your feet are one of the smelliest body parts because they’re constantly sweating inside your boots, If boots are wet with perspiration after a hunt, put them on a boot dryer and then sprinkle in some baking soda. You’ll have very few animals cut your track after applying this tip.